Unlike other students, Minnie does not have a comprehensive biographical record. However, here is what can be pieced together from the documents found within her student file provided by the Carlisle Indian School Digital Resource Center. 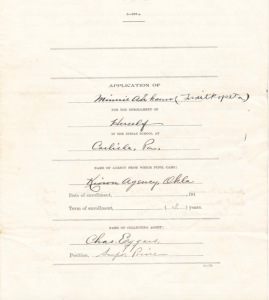 By virtue of the physical records, letters, and an enrollment application found within Minnie’s file, this biographical information is reminiscent of Minnie’s life during her time at the Carlisle Indian school. Minnie Tsait-Kopeta was a member of the Kiowa Nation born and raised in Oklahoma. She was 18 years old and had one brother and one sister. 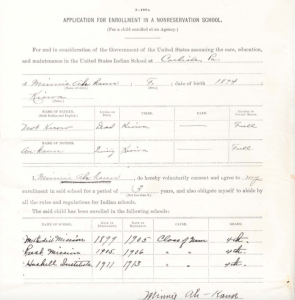 Minnie applied to the Carlisle Indian School enrolled for three years. However, she only spent one year at the school. She attended the Carlisle Indian school from October 18, 1913 to June 5, 1914. Her cause of discharge was that she was released to go home. 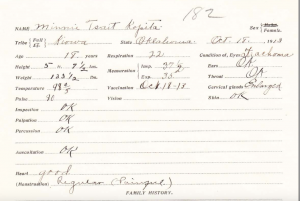 This entry was posted in Minnie Kopita, Resistors and tagged Biographical records, Student Files. Bookmark the permalink.